Chelsea could lose Eden Hazard on the cheap this summer as Real Madrid are reportedly only willing to go as high as £68million for the Belgium international. 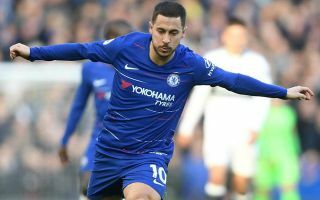 This is a big worry for the Blues, with Hazard nearing the end of his contract and with the club hoping to recoup more like £103m for their star player, according to Don Balon. Chelsea’s weak negotiating position means Madrid will no doubt be confident they can get Hazard on the cheap, with the 28-year-old currently on course to be a free agent at the end of next season. This is a huge blow for CFC, who lost Thibaut Courtois to Real Madrid last summer in similar circumstances as he also ran his contract down to its final year. Losing Hazard could be an even bigger blow for Chelsea to deal with, however, with the former Lille star likely to prove a very tough player to replace, especially if they only bring in £68m from his sale. Christian Pulisic is already on his way to Stamford Bridge this summer, but it would be a big ask for the USA starlet to immediately step in and replace Hazard in attack.